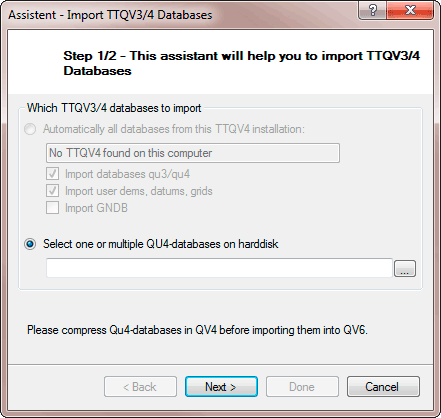 QuoVadis can automatically import all your data and maps from an older TTQV3 or TTQV4 installation. 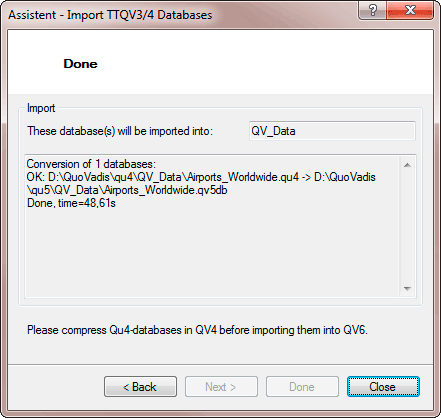 Important note: You should compress your databases in QV4 before importing them into QuoVadis to fix possible problems with database integrity. You find an instruction on how to do this at the end of this chapter. After the installation of QuoVadis7, a data migration assistant will automatically start if older versions of QV3 or QV4 are detected on your PC. However, you can also start the assistant from the database menu of the X-Plorer through the function Import QV3/4 Databases. The assistant will detect older QV installations automatically and will provide the option to import all databases. Additionally, you can import existing databases through the software switch Import GNDB. The worldwide Geographic Database will not be imported to QuoVadis because this has bee recompiled for Version 6 and is delivered with your QuoVadis version. So, this function is limited to your own geographic databases and to geographic databases of some topomaps which may be compatible with QV. The scope of supply of QuoVadis 7 contains a location database with nearly 5 million entries. You can download them from the download page of the QuoVadis-shops. You can also import digital elevation models (DEMs) which may be part of your QV4 installation and user-defined grids or map datums. If you would like to do so, activate the Import own dems, map data, grids. To the upper right, QV will indicate to which database element the selected data will be imported. If you start the assistant manually from the database menu, the actual database which is marked in the X-Plorer will be used as default destination. Thereafter, please click Done to start the import. According to the amount of data, the impoprt process can last quite a while. However, you can abort the data import at any time and continue later on. Data which have already been imported will be detected and will not be imported once again. At the end of the import process you will find a summary which might also include error messages which occured. Remark: If maps are imported from older QV versions, map files will not be duplicated but stay in their original directories. So there is no need to worry about waste of hard disk space. Important note: You should compress your databases in QV4 before importing them into QuoVadis 7 to fix possible problems with database integrity.